The position of Atholl and his circle of close supporters only collapsed after Earl Walter's heir Robert Stewart had been captured and who, in Shirley's account, confessed to his part in the crime. 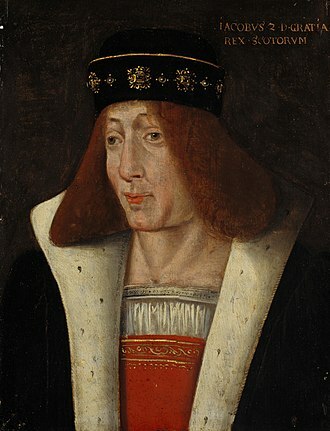 Walter was taken prisoner by Angus and held at the Edinburgh Tolbooth where he was tried and beheaded on 26 March 1437, the day after the coronation of the young James II. Sir Robert Graham, the leader of the band of assassins was captured by former Atholl allies and was tried at a session of the council sitting at Stirling castle and subsequently executed sometime shortly after 9 April. ^ "James I: The Key Will Keep The Lock". Edinburgh International Festival. 2018-10-12. He was the first Earl of Buchan since John Comyn, from 1382 until his death. Alexander married the widowed Euphemia I, Countess of Ross, but they had no children although he did have a family by his longtime mistress. Alexander was Justiciar of Scotia for a time, but not an effective one and he held large territories in the north of Scotland before eventually losing a large part of them. 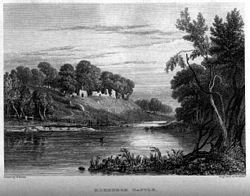 Alexander is remembered for his destruction of the burgh of Elgin. His nickname was earned due to his notorious cruelty and rapacity and his father, Robert the Steward, had acquired the lands of Badenoch probably from Euphemia, Countess of Moray who had become his second wife. Robert had a petulant relationship with his uncle, King David II of Scotland, following Roberts accession to the throne, Alexander was formally made Lord of Badenoch on 30 March 1371. In October 1372, Alexander was given the Royal Lieutenancy for those lands outwith the Earldom of Moray north and west of Inverness and added lands in Aberdeenshire and north Perthshire. In the same year, he was Royal Justiciar in the Appin of Dull in Perthshire which meant that Alexander held crown authority from north Perthshire to the Pentland Firth. Alexander de Ard, a claimant for the Earldom of Caithness. However Alexander effectively doubled his holdings when he married Euphemia Countess of Ross. Alexander became the jure uxoris Earl of Ross and this provided him the Ross lands, other lands belonging to his wife — including Lewis, Skye and Kingedward in Aberdeenshire — he held in joint ownership with her. His possession of the Barony of Kingedward, a part of the former Earldom of Buchan allowed King Robert to give Alexander the title of Earl of Buchan only days after his marriage. 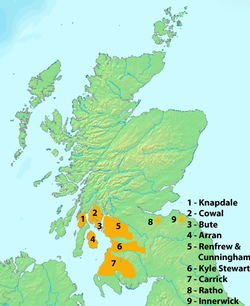 Alexander ruled these territories with the help of his own private cateran forces, building up resentment among other land owners and this included Alexander Bur, Bishop of Moray. 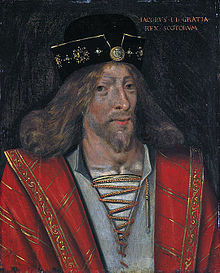 The Randolph family did not hold the Earldom for long and it reverted to the crown on the death of Thomass son John, in 1346, in 1365 bishop Bur persuaded David II that his lands in Badenoch and Strathspey should be governed as if in regality. Eleanor of Scotland was a daughter of James I of Scotland and Joan Beaufort. 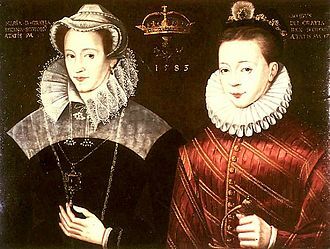 She was an Archduchess of Austria by marriage and a noted translator, Eleanor was the sixth child of James I of Scotland and Joan Beaufort. James I was known for his love of literature which he passed on to Eleanor. 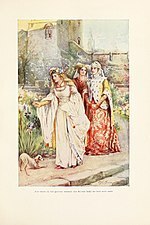 Starting in 1445, Eleanor lived at the court of Charles VII of France, in 1447, she accompanied Marie of Anjou, Queen of France, on a pilgramage on Mont Saint-Michel. In 1448 or 1449 the teenage Eleanor married Sigismund, a Habsburg Duke, Archduke of Further Austria, Eleanor served as regent for her husband from 1455 to 1458 and again in 1467. Heinrich Steinhöwel dedicated his translation of Boccaccios On Famous Women to Eleanor, Eleanor was a great lover of books and literate in several languages. She translated The History of the Kings Son of Galicia, named Pontus, the French original passed through several editions between 1480 and 1550. In addition to translating the work, Eleanor revised it to increase the power of women. Murdoch Stewart, Duke of Albany was a leading Scottish nobleman, the son of Robert Stewart, Duke of Albany and the grandson of King Robert II of Scotland, who founded the Stewart dynasty. In 1389, he became Justiciar North of the Forth, in 1402, he was captured at the Battle of Homildon Hill and would spend 12 years in captivity in England. However, in 1425, soon after Jamess coronation, Stewart was arrested, found guilty of treason and his only surviving heir was James the Fat, who escaped to Antrim, where he died in 1429. Stewarts wife Isabella of Lennox survived the destruction of her family, and she would live to see the murder of James I, Stewart was born in 1362, the only son of Robert Stewart, Duke of Albany and his wife Margaret Graham, Countess of Menteith. Duke Robert was a leading Scottish nobleman who was Regent of Scotland at various stages during the reigns of three kings, in addition, Duke Robert held the titles of Earl of Menteith, Earl of Fife, Earl of Buchan and Earl of Atholl. In 1389, at around age 27, Murdoch was appointed Justiciar North of the Forth and son would now work together to expand their family interest, bringing them into violent confrontation with other members of the nobility such as Donald McDonald, 2nd Lord of the Isles. While returning to Scotland, they were intercepted by English forces led by Henry Percy, the result was a decisive defeat of the Scottish army. William Shakespeare wrote, in the play Henry IV, part 1, Ten thousand bold Scots and twenty knights, Balk’d in their own blood did Sir Walter see On Holmedon’s plains. Of prisoners, Hotspur tookMordake the Earl of Fife, and eldest son To beaten Douglas, and the Earl of Athol, Of Murray, Angus, ---Shakespeare, Henry IV, part 1, act 1, scene 1. Murdoch Stewart would be a prisoner in England for the twelve years. Murdoch Stewarts captivity in England did not prevent his father from pursuing the family interest. In 1402 The Duke of Albanys nephew, David Stewart, Duke of Rothesay, died in Falkland Palace while under his uncles protection. Robert Stewart, Duke of Albany, a member of the Scottish royal house, served as regent to three different Scottish monarchs. He held the titles of Earl of Menteith, Earl of Fife, Earl of Buchan and Earl of Atholl, in addition to his 1398 creation as Duke of Albany. A ruthless politician, Albany was widely regarded as having caused the murder of his nephew, the Duke of Rothesay, James was held in captivity in England for eighteen years, during which time Albany served as regent in Scotland, king in all but name. Robert Stewart was the son of the future King Robert II of Scotland. Roberts grandfather was Walter Stewart, 6th High Steward of Scotland and his great-grandfather was Robert the Bruce, legendary victor of the Battle of Bannockburn. Robert Stewart was raised in a family with many siblings. 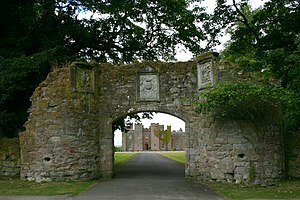 His older brother John Stewart became Earl of Carrick in 1368, in 1361 Stewart married Margaret Graham, Countess of Menteith, a wealthy divorcee who took Robert as her fourth husband. His sister-in-laws claim to the Earldoms of Menteith and Fife allowed him to assume those titles, becoming Earl of Menteith, in 1362 the couple had a son and heir, Murdoch Stewart, who would in time inherit his fathers titles and estates. Stewart was responsible for the construction of Doune Castle, which remains intact today. 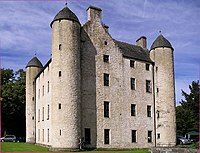 When Stewart was created Earl of Menteith, he was granted the lands on which Doune Castle now stands, building may have started any time after this, and the castle was at least partially complete in 1381, when a charter was sealed here. Scottish politics in the late 14th century was unstable and bloody and he led several military expeditions and raids into the Kingdom of England. Although in 1398 Robert was himself appointed Duke of Albany, bringing him still greater power and wealth, power had begun to shift away from Albany, the English soon invaded Scotland, and serious differences emerged between Albany and Rothesay. Rothesay was arrested and imprisoned in Albanys Falkland Castle where he died in March 1402, Rothesays death probably lay with Albany and Douglas who would have looked upon the possibility of the young prince acceding to the throne with great apprehension. Albany certainly fell under suspicion but he was cleared of all blame by a general council, after Rothesays death, the King began to fear for his second son James, who fled Scotland for his own safety. Joan Stewart, Countess of Morton, called Joanna, was the daughter of James I, King of Scotland, and the wife of James Douglas, 1st Earl of Morton. She was known, in Latin, as the muta domina of Dalkeith,1428, she was the third daughter of James I of Scotland and Joan Beaufort. Joan had two brothers, including the future King of Scotland, James II, and five sisters. She had “the misfortune to be deaf and dumb”, and was known as muta domina or “the mute lady”, Joan was reported to have used sign language to communicate, even in public. Joan was originally contracted to marry The 3rd Earl of Angus on 18 October 1440, in 1445 she was sent to France and did not return home to Scotland until 1457. She had been promised in marriage to the Dauphin of France but the marriage did not take place, Joan married The 4th Baron Dalkeith before 15 May 1459, who at the time of their marriage was raised to the peerage as the first Earl of Morton. They were granted a dispensation on 7 January 1463-4 for being consanguineous in the second, the Countess Joanna died in 1493, predeceasing her husband, James, by several months. Henry Percy, 2nd Earl of Northumberland was an English nobleman and military commander in the lead up to the Wars of the Roses. He was the son of Henry Hotspur Percy, and the grandson of Henry Percy and his father and grandfather were killed in different rebellions against Henry IV in 1403 and 1408 respectively, and the young Henry spent his minority in exile in Scotland. 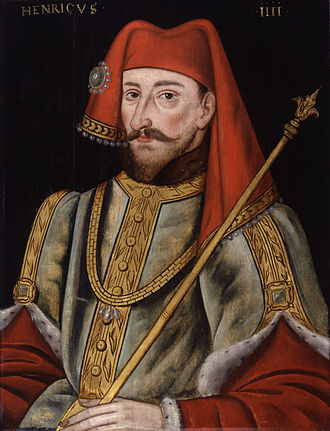 Only after the death of Henry IV in 1413 was he reconciled with the Crown, in the following years, Northumberland occasionally served with the king in France, but his main occupation was the protection of the border to Scotland. 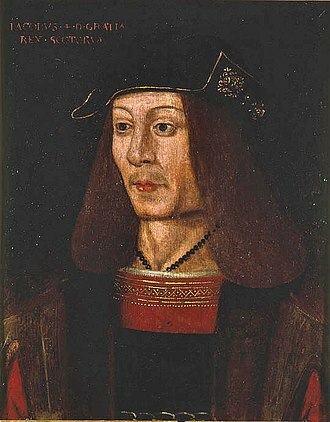 At the same time, a feud with the Neville family was developing, particularly with Richard Neville and this feud became entangled with the conflict between the Duke of York and the Duke of Somerset over control of national government. The conflict culminated in the first battle of the Wars of the Roses, at St Albans, Henry Percy was the son of another Henry Percy, known as Hotspur, and Elizabeth Mortimer. Elizabeth was the daughter of Edmund Mortimer, Earl of March and Philippa, hotspurs father – the young Henrys grandfather – was called Henry Percy, and in 1377 became the first of the Percy family to hold the title of Earl of Northumberland. 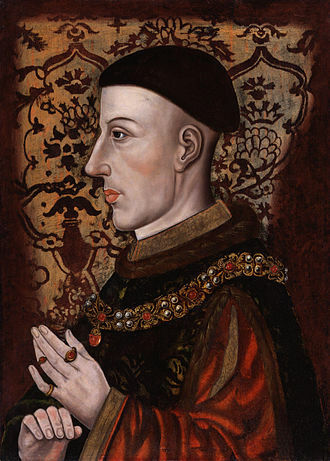 Both Hotspur and his father were early and active supporters of Henry Bolingbroke, who usurped the throne from Richard II in 1399 and they were initially richly rewarded, but soon grew disillusioned with the new regime. Hotspur rose up in rebellion, and was killed at Shrewsbury on 21 July 1403, Earl Henry was not present at the battle, but there is little doubt that he participated in the rebellion. After a short imprisonment, he was pardoned, and in June 1404 he delivered his grandson into the custody at Doncaster. By May 1405, the earl was involved in another rebellion and his plans failed, and he was forced to flee to Scotland, taking his grandson with him. The following years were marked by an itinerant life and further plotting, on 19 February 1408, the first earl of Northumberland was killed in the Battle of Bramham Moor, leaving the young Henry Percy as heir apparent to the earldom. Margaret of Scotland was a Princess of Scotland and the Dauphine of France. She was the child of King James I of Scotland. She married the eldest son of the king of France, Dauphin of France and their marriage was unhappy, and she died childless at age 20, apparently of a fever. She was born in Perth, Scotland to James I of Scotland and Joan Beaufort, Margaret was the first of six daughters and twin sons born to her parents. 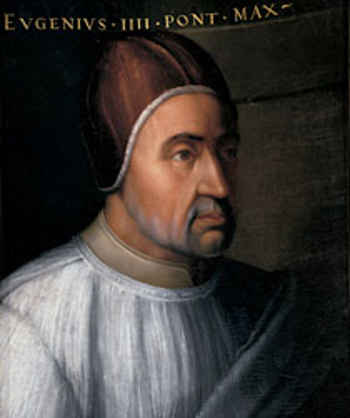 Margaret was Charles VII of Frances diplomatic choice for daughter-in-law, the marriage was forced upon Charless thirteen-year-old son, which did not help their relationship. However, royal marriages in the 15th century were always political, there are no direct accounts from Louis or Margaret of their first impressions of each other, and it is mere speculation to say whether or not they actually had negative feelings for each other. Several historians think that Louis had an attitude to hate his wife. Margaret and Louis marriage shows both the nature of medieval royal diplomacy and the position of the French monarchy. The marriage took place 25 June 1436 in the afternoon in the chapel of the castle of Tours and was presided by the Archbishop of Reims, by the standards of the time, it was a very plain wedding. Louis, looked more mature than his bride. Margaret looked like a beautiful “doll, ” perhaps because she was treated as such by her in-laws, Charles wore “grey riding pants” and “did not even bother to remove his spurs. ”The Scottish guests were quickly hustled out after the wedding reception. This was seen as something of a scandal by the Scots, King Charles’ attire and the speed with which the guests were hustled out was considered an insult to Scotland, which was an important ally in Frances war with the English. However, this spoke to the nature of the French court at this time. They simply could not afford an extravagant ceremony or to host their Scottish guests for any longer than they did, following the ceremony, “doctors advised against consummation” because of the relative immaturity of the bride and bridegroom. The Cathedral of St Andrew is a ruined Roman Catholic cathedral in St Andrews, Scotland. It was built in 1158 and became the centre of the Medieval Catholic Church in Scotland as the seat of the Archdiocese of St Andrews and it fell into disuse and ruin after Catholic mass was outlawed during the 16th-century Scottish Reformation. It is currently a monument in the custody of Historic Scotland, the ruins indicate that the building was approximately 119m long, and is the largest church to have been built in Scotland. The cathedral was founded to supply more accommodation than the church of St. Regulus afforded. This older church, located on became the cathedral grounds, had been built in the Romanesque style. Today, there remains the square tower,33 metres high, on a plan of the town from about 1530, a chancel appears, and seals affixed to the city and college charters bear representations of other buildings attached. To the east is an older religious site, the Church of St Mary on the Rock. Work began on the new cathedral in 1158 and continued for over a century, the west end was blown down in a storm and rebuilt between 1272 and 1279. It was dedicated on 5 July 1318, in a ceremony before King Robert I. When intact it had, besides a central tower, six turrets, a fire partly destroyed the building in 1378, restoration and further embellishment were completed in 1440. The cathedral was served by a community of Augustinian Canons, the St Andrews Cathedral Priory and Blackfriar friars had properties in the town by the late 15th century and possibly as late as 1518. In 1559, during the Scottish reformation, the building was stripped of its altars and images, at about the end of the sixteenth century the central tower apparently gave way, carrying with it the north wall. Afterwards large portions of the ruins were taken away for building purposes, since it has been tended with scrupulous care, an interesting feature being the cutting out of the ground-plan in the turf. The principal portions extant, partly Norman and partly Early Scottish, are the east and west gables, the part of the south wall of the nave. St Rules tower is located in the Cathedral grounds but predates it, the building was retained to allow worship to continue uninterrupted during the building of its much larger successor. The Firth of Forth is the estuary of the River Forth in Scotland, where it flows into the North Sea, between Fife to the north and Lothian to the south. It was known as Bodotria in Roman times, in the Norse sagas it was known as the Myrkvifiörd. Geologically, the Firth of Forth is a fjord, formed by the Forth Glacier in the last glacial period, the Kincardine Bridge, the Clackmannanshire Bridge, the Forth Road Bridge and the Forth Bridge carry traffic across the firth. Queensferry Crossing, alongside the Forth Road Bridge, was expected to open in 2016 but has since been delayed until May 2017. From 1964 to 1982, a tunnel existed under the Firth of Forth, the shafts leading into the tunnel were filled and capped with concrete when the tunnel was closed, and it is believed to have filled with water or collapsed in places. In July,2007, a passenger service completed a two-week trial between Portobello and Kirkcaldy, Fife. The trial of the service was hailed as an operational success. It was estimated the service would decrease congestion for commuters on the Forth road, despite the initial success, the project was cancelled in December,2011. Beauforts surname probably reflects his fathers lordship of Beaufort in Champagne, France. The Beaufort children were declared legitimate twice by parliament during the reign of King Richard II of England, in 1390 and 1397, between May and September 1390, Beaufort saw military service in North Africa in the Barbary crusade led by Louis II, Duke of Bourbon. In 1394, he was in Lithuania serving with the Teutonic Knights, john was created Earl of Somerset on 10 February 1397, just a few days after the legitimation of the Beaufort children was recognized by Parliament. The same month, he was appointed Admiral of the Irish fleet, as well as Constable of Dover Castle, in May, his admiralty was extended to include the northern fleet. That summer, the new earl became one of the noblemen who helped Richard II free himself from the power of the Lords Appellant. As a reward, he was created Marquess of Somerset and Marquess of Dorset on 29 September, and sometime that year he was made a Knight of the Garter and appointed Lieutenant of Aquitaine. In addition, two days before his elevation as a Marquess he married the niece, Margaret Holland, sister of Thomas Holland, 1st Duke of Surrey. John remained in the kings favour even after his older half-brother Henry Bolingbroke was banished from England in 1398, nevertheless, he proved loyal to his half-brothers reign, serving in various military commands and on some important diplomatic missions. In 1404, he was named Constable of England, john Beaufort and his wife Margaret Holland, the daughter of Thomas Holland, 2nd Earl of Kent and Alice FitzAlan, had six children. His granddaughter Lady Margaret Beaufort married Edmund Tudor, 1st Earl of Richmond, Somerset died in the Hospital of St Katharines by the Tower. He was buried in St Michaels Chapel in Canterbury Cathedral, Thomas Beaufort, Count of Perche Edmund Beaufort, 2nd Duke of Somerset Margaret Beaufort, Countess of Devon married Thomas de Courtenay, 13th Earl of Devon. As a legitimated grandson of the sovereign, Beaufort bore the arms of the kingdom, differenced by a bordure gobony argent, the family emblem featuring the portcullis was shown on the reverse of British pennies minted between 1971 and 2008. 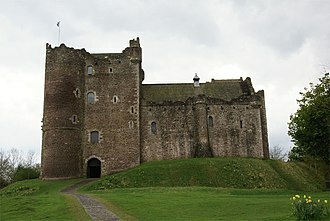 Doune Castle, built by Stewart, still stands today. Falkland Palace, where Robert Stewart's nephew, the Duke of Rothesay, died in mysterious circumstances. Stewart's son, John Stewart, 2nd Earl of Buchan, in a late-18th-century engraving. Buchan was killed at the Battle of Verneuil in 1424. 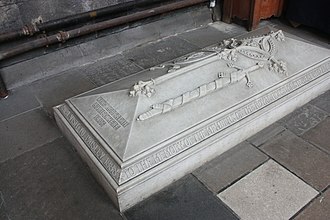 Stewart's sarcophagus-effigy at Dunkeld Cathedral, where he was buried. The "Wolf's Lair": Lochindorb Castle at Lochindorb in Badenoch, stronghold of Alexander. 19th century depiction of the burning of Elgin Cathedral. 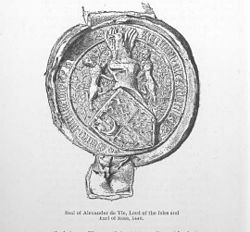 The seal of Alexander. It includes his arms, which contains the arms of the Lordship of the Isles and the Earldom of Ross, surrounded by a royal tressure, indicating Alexander's royal blood as the grandson of King Robert II of Scotland. Inverness Castle, the location of Alexander's first captivity. Although the modern castle is not medieval, the site is. Tantallon Castle, the location of Alexander's second captivity. 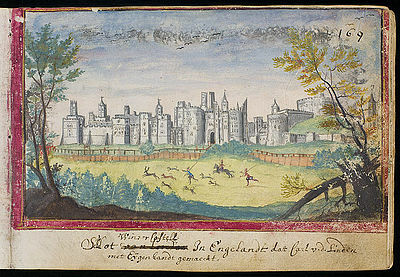 The Battle of Verneuil, where Albany's brother John Stewart, Earl of Buchan was killed and his army destroyed. 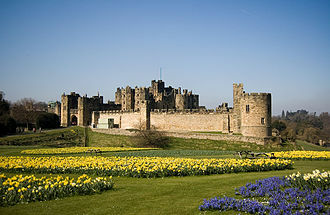 Warkworth Castle in Northumberland was the main residence of the Percy family. Henry Percy was buried at the abbey of St Albans Cathedral.